We’ve picked up walking again after quite a long period when it hasn’t been a major focus in our lives. For a few years we were putting everything into running, and were really pleased about that. We managed to complete a 10k and a few half-marathons with times that made us happy. We could run 10 miles quite comfortably and 13 at a stretch. We were just starting to look towards distances north of the half-marathon mark when the inevitable physical frailties of the human knee put paid to all our plans. There were diagnoses and operations. And a feeling that the kinds of outdoor activities that we had been doing for years would have to be radically rethought (since abandoning them altogether was unthinkable). The running stopped and distance walking looked for a while to be a real problem. Confidence was a major issue – was perhaps the defining issue as you can’t set out to walk even six miles if you fear you will start hobbling after three. The dent to the confidence thus proves even more pernicious than the underlying condition. The first thing to come back was the geocaching. We did a few long walks where we picked up a few dozen caches at a time, although generally on very forgiving terrain (Milton Keynes and environs featured heavily). Bracing and strapping knees turned out to be an effective way of keeping them going. We did a brilliant 19km hike on Christmas day one year where each stage revealed the destination of the next, and we didn’t know where we were going until we got there. And then we had a walking holiday in the south-west while, not altogether on the coast path, certainly incorporated several long and hilly sections of our old stamping ground. Maybe things were not as far gone as we feared. 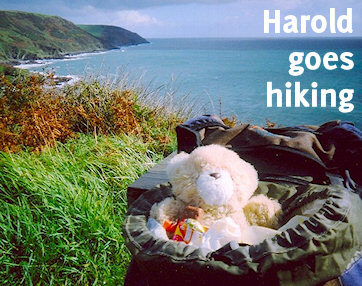 This holiday involved staying at Hartland Quay – fulfilling a long-held ambition after we spent a single night there when walking the Coast Path many years ago. Every single day we looked out across the Bristol Channel and saw Lundy, the island 12 miles off Hartland Point, only accessible at this time for a few more weeks by boat, looming on the horizon like a nest of sirens. We had always wanted to go to Lundy and debated very seriously going on a daytrip. But we decided against this and instead booked ourselves five days on this granite outcrop for the following February. Lundy might not seem much of a destination for walkers. It is three miles long and roughly half a mile wide, which means by simple arithmetic that the longest distance to be obtained is seven miles. But the terrain is extremely demanding and, if knees can hold up to a few days here, then it does inspire confidence that they can hold up anywhere. And the knees did pretty much hold up, at least until the very last day. It’s taken a few months since then and awareness that we need to finally let the running go, at least for a time, if we are ever going to get back to it. But now we are back on a training schedule of regular long walks with our eyes on a challenge event in the spring. We’ve still got a lot of our residual fitness and all the mental resilience developed for endurance running. We’re really feeling the health benefits too. Here’s to a possible marathon distance in 2017? Categorised under Out and about, tagged under arthritis, Geocaching, Hartland Quay, Lundy Island.